Takaki Toono and Akari Shinohara, two very close friends and classmates, are torn apart when Akari's family is transferred to another region of Japan due to her family's job. Despite separation, they continue to keep in touch through mail. When Takaki finds out that his family is also moving, he decides to meet with Akari one last time. 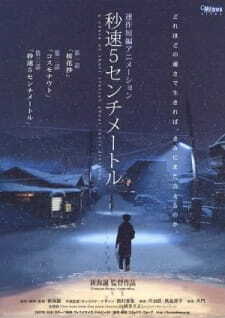 Byousoku 5 Centimeter was completed on January 22, 2007. The first of three parts was available for streaming on Yahoo! Japan exclusively for its premium users between February 16 and 19. The complete film was released on March 3, 2007. The film won the 2007 Asia Pacific Screen Award for Best Animated Feature Film. From Makoto Shinkai (Voices of a Distant Star, The Place Promised in Our Early Days) comes 5 Centimetes per Second, a movie that tells the story of two childhood friends in love, and how they try to keep their relationship going through hardships that life throws at them. Throogh three small stories, or episodes as they're called, we're told the tale of how they grow up and farther away from each other. The movie tells of a love that's slowly torn apart because the lovers move further away, both in heart and home. It's underlying themes are beautifully incorporated into the story; about growing up, letting go of an unreachable past, and taking control of one's own life. Though they're not necessarily very obvious throughout the movie, the final scene symbolizes these themes, and what the main characters decided on in the end. The character we follow through the movie is Takaki Tohno, and we get to see how he looks on the events that unfold as a child, a teenager and finally, and adult. We see how he develops through these stages of life, and how it all relates to his childhood friend and love, Akari Shinohara. The emotions are protrayed in an incredibly beautiful and realistic way; how they portray the love between Akari and Takaki, how they portray the girl who has a crush on Tohno during his high school years, Kanae Sumida, and finally, how they portray their development from children to adults all makes them characters you'll place your heart with. They're characters you'll love, feel sad with, and you'll wish for them to live happily. The animation quality is astounding, from the detail in backgrounds to the astounding ligthing effects and camera angles that help bring the mood of the scenes to a level different from mostly anything else. The only beef I have is that the characters' faces lost a bit of detail from time to time, but aside that the movie is a visual pleasure that goes beyond pretty much everything I've ever experienced. Tenmon, who's made the soundtrack to other Shinaki films, does an astounding job on the soundtrack for the movie, with piano pieces that effectively and beautifully amplifies the mood of the movie, be it melancholy, calmness or nostalgia. However, if you don't like piano soundtracks, chances are you'll not like it, since it's mostly the piano that's used throughout the movie (I love them though, and that's what made me give it a 10). 5 cm per Second is a movie that takes a story of growing up and makes it into something that cannot be described as anything less than a masterpiece, with astounding themes, storytelling, art and sound. If someone told me I could watch one movie before I died, I'd undoubtedly choose this one. I'm...confused. I wanted so much to enjoy this movie. I was absolutely sure that this was going to be one of those works of art that leaves you breathless, sitting there for minutes, maybe even an hour after it finishes, just trying to take it all in. If you love this movie, you will most likely hate me for this review. Call me someone with a heart of ice, whatever you will. I am simply expressing my thoughts on it. I'll break this into a two-part review. The first part will be my thoughts, written as I think of them, the second part an analysis with numbers for those who prefer it that way. Oh, I am sitting here, after watching the movie, but it's not out of awe, it's out of bewilderment because despite all the reviews and recommendations from ,everyone that proclaim it the best movie ever, that the message of it is poignant and beautiful...I can't say that I fully agree. Maybe it's because I'm a heartless robot who has never felt love before, you would say, but no, I've cried and felt emotional at even the smallest hints of feeling, and I've most definitely been in love, known what it's like to feel heartbreak, desolation, the chill when you know the person you love will never share your feelings. But for some reason...I couldn't relate to this movie, try as I might. Why did this movie completely fail my expectations? I'm still trying to make sense of it as I write this review. I'm a bit disappointed in myself, because it seems everyone else except for me was touched by this anime while I appear to be some stone-cold freak of nature. I had the tissues ready, the feels shield up, the family relocated to another room so that I could peacefully watch this and take all the dialogue in. The most outstanding issue in 5 Centimeters per Second, for me, is that I don't feel that there was enough character development. I understand. Toko is in love with Akari, and in the first part, she reciprocates his feelings, but they can't be together. Yes, that is sad, but the way it was expressed just didn't seem to impact me. At the end of the movie, I don't know anything about them except that they're star-crossed lovers who, unfortunately, can't be with each other. The movie does have wonderful messages in it. You have to move on from the past, learn to let go, and know when it's time to move on. However, I don't think that message is unique to this movie only. I've seen it expressed many times before. The story is interesting, but I think it needed a lot more plot and character development. Yes. We can relate to the characters as they experience loss, heartbreak, falling in love for the first time. But for some reason, I didn't feel as though there was enough effort put into making the watchers really connect, to strengthen that link of empathy. I appreciate the symbolism used in this anime. The messages are indeed deep and something that many can relate to, but in my opinion they were not conveyed in the right way. I also think that some of the lines from the movie are elegant...Overall, this anime seemed to have all the elements to be wonderful, but for me, they didn't come together. It started out promising, but spiraled into something a bit boring and, at least for me, terribly predictable. The story is well-thought out and I liked how it was broken up into three parts, but it moved very quickly, and at the end I found myself shocked that there wasn't something more. It would have been much better if even half an hour was given to plot development. The way the story is played out is in soft hints of emotion, feelings that can be easily related to, and in a relatively tranquil way, but because of this, I felt that it was difficult to find the actual point of the plot. When the movie ended, I sat there and asked myself, "so what?". The answer was simply that "We have to learn when and how to move on". I was hoping that I would have been able to think of more. I appreciate, though, how it was portrayed realistically throughout, with nothing cheesy or sugar-coated. Ah, but I do have to say, the artwork in this movie is outstanding! The backgrounds, lighting, climate, everything. I was spellbound by the gorgeous landscapes that were concocted, with the perfect touch of surrealism and fantasy at every part. You see a routine town setting, and then look up at the sky...a nebulous wonderland, full of stars, conveying the idea that there really is no boundary to where we can go. I can't give this category a 10, however, because the people were somewhat disconcerting amongst all this scenery. I didn't feel as though as much effort was put into drawing them, and they looked a bit odd at times. I play the piano, so all the piano songs in the background stood out and they really did provide a lovely backdrop for the movie, which is peaceful and not full of action or drama. The background music could most certainly put me at ease in any situation. I also appreciated the realistic sound effects, reminiscent of the sounds in a Miyazaki movie. It's clear that a lot of effort was put into this movie. These characters should be relatable. At times, I felt like I could relate to them. However, they were greatly lacking in personality development. Maybe, though, it's the point of the movie. As was noted in an article that I read some time ago, if the characters in a work of art are relatively simple, we use them as blank canvases on which to paint our own emotions. I think I would have appreciated a bit more character structuring, though. Like I said in the beginning of this review, I sat there the entire move trying very hard to like it. At some points, I did. I could appreciate the messages, clear or somewhat hidden, that were being given. However, for most of the movie, I was bored, as though I was waiting for something to happen. Maybe this is because I thought it would be a lot more sad than it turned out to be. The messages in 5 Centimeters per Second are beautiful. I believe that they should have been conveyed more through character actions than through them having to tell a story to us using words. As I continue through my life, perhaps I will encounter scenarios that will make me think of this movie. I would still recommend that people watch this movie, because there are lessons to be learned and chances are that they'll enjoy it much more than I did, looking at the sheer amount of 10s that this movie has received. Until then, I'll continue pondering this movie, and why I, usually so quick to empathize with others and share emotions, was not moved by this piece. If my opinions change, I will be back to write another review. As was the message of Howl's Moving Castle, hearts can change, and people can too. I happened upon this anime in several anime fan sites as it was considered one of the higher rated animes even until today. Reading how some people said it rivaled works that of Miyazaki, I had high expectations for it. But unfortunately it was a total letdown. The only thing I really enjoyed about the movie was the animation quality and detail that was put into the movie. The animation was just simply beautiful from the vividness of the background to the fluid motion of characters but then, sadly, the praise ends here. The story and the characters were very anti-climactic as no real progress is met by the characters with one another. This is however how the creator of the story wished for it to be i think as the title is named &quot;5 centimeters per second&quot;. It was a collection of short stories about human distance. I'll say though that the concept and execution were nice but the story itself was lacks proper closure as it presents the audience with the concept but then leaves it at the presentation with no real conclusion. The story began as a cultured glass of wine then slowly transforming into wine in a box. The depth slowly filled in as the stories progressed. They were written just so that a concept could be brought to stage and left there to be a static attraction for the audience. So if you're looking for a totally artistic and visually pleasing feature with no real concern for a happy ending with much depth in the end then give this one a looksy. I finally got to see this movie, and after watching Voices of A Distant Star and The Place Promised, My expectations were high. And once again, Shinkai's work delivers. The story of the movie's three episodes is absolutely nothing to write home about, as there is no exciting plot with twists and turns. Rather than focusing on epic storylines and grandiose plots, 5 Centimeters per Second, like the rest of Shinkai's creations, focuses on a small core set of characters and their relations to each other. The main selling point is how the characters interact, and how precisely and skillfully their emotions is portrayed. The art is as one would expect from Shinkai. The backgrounds and the various scenes are depicted in a more beautiful way than in any other anime I have ever seen, and many great works of art pale in comparison to the beautiful, living scenes Shinkai delivers. All the little details from the magazines in the shops to the rime on the windows and the clouds in the sky blend perfectly, and is in my opinion, the thing that defines this movie as the masterpiece it is. Especially the skies look unbelievably beautiful, and really creates the atmosphere in the movie. The characters on the other hand, are far more sketchy, at least compared to the environments, yet the whole thing meshes perfectly together once you get used to it. And that shouldn't take long. The sound does not stand out too much, except for the insert song right at the end, but rather blends into the wholeness of the movie, and becomes a part of it. If you do try to simply listen to the music, it is rather good, but the truly wonderful thing about it is how it becomes one with the scenery, the characters and everything, and does just what it is supposed to do: help create the feeling and the atmosphere of the movie. As with the story, the characters are not the usual kind of characters I would give top ratings to. They are not especially exciting individuals with dark mysterious pasts or epic quests, but rather normal people just like (most of) us. Yet, it is this normality that is the winning factor of the characters, they are normal people with feelings, hopes and dreams, and it is these hopes, dreams and feelings that bears the entire movie. And the most important thing, the characters are presented in such a way that you truly feel you know them, that you can understand them and sympathize with their cause. With the beautiful art, the atmospheric sound and the simple, yet complex characters and their all too familiar emotions, 5 Centimeters per Second portrays the melancholic feelings of loneliness and uncertainty, the empowering fire of hope and love, and the harsh ceaseless march of reality in such a way that one can truly feel it and recognize it. It is a beautiful and simple, yet complex story of emotions, hope, sadness and distance between people. This inevitably tragic story portrays perfectly how reality marches ever onward, heedless of peoples hopes and dreams, and how happiness is always just out of reach. Poll: What do you think happens to Akari and Tataki after the movie? Makoto Shinkai has made several feature films and short over the years, but the emotional core and visual style of his films has stayed the same.